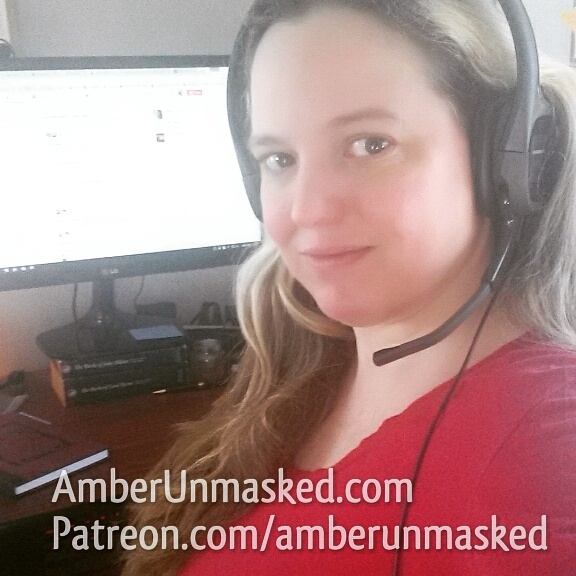 AMBER LOVE 04-JAN-2017 Content like reviews are supported by donors at my tip jar on Patreon.com/amberunmasked. You can also buy my books and share the links. DEEP FRIED TROUBLE is the first cozy mystery by Tyora Moody that I’ve read. I was looking to expand my reading which meant not turning to my usual pile of favorite authors. 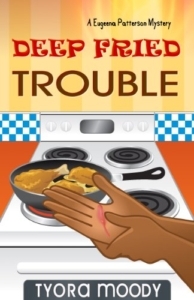 This cozy is the first of the Eugeena Patterson mystery series. Eugeena quickly became a protagonist that I wanted to know. She bucks the homogeneous mold of white, 30-something, supermodel gorgeous leading lady. She’s 59, diabetic, a retired middle school teacher, devoutly Christian, widowed, and African-American. Moody’s descriptives for the boiling heat of South Carolina were cleanly woven into the dialog and narration. I could feel the uncomfortable 90+ degrees of the southern sun reminding me why I will never live down there. The first person perspective provided a way for the reader to be right there with Eugeena as she dealt with all her family problems and the two mysterious attacks on women who live on her block. Eugeena goes through a wonderful development where she finds flaws in everyone, including each of her children, only to realize that she was misjudging. The one time her misjudging for the better happens is when she accidentally trusts the person who ends up being the killer. Moody kept me guessing until the big reveal. I was proud of Eugeena for her bravery and for the realistic length of time it takes her to forgive people. Eugeena has a strong, loving personality and no matter how old her children get, she knows they will always be her babies. Speaking of the Patterson clan, it was another element of realism in Moody’s character construction. The two older sons are successful though only one is “settled down” with a wife and twins; her daughter is the youngest and appears to be the failure of the lot. Yet, Leesa returns after a breakdown of postpartum depression to continue studying for college and being a single mother. Leesa has the hardest of the struggles with an abusive police officer for an ex-boyfriend and baby daddy. She tried to make it on her own, but the birth of her second child was too much. She needed her mother and fortunately, Eugeena is the type to bail out her kids when they’re hurting and need her.